DURING THE TIME of Plato and Aristotle (circa 390 B.C.E. 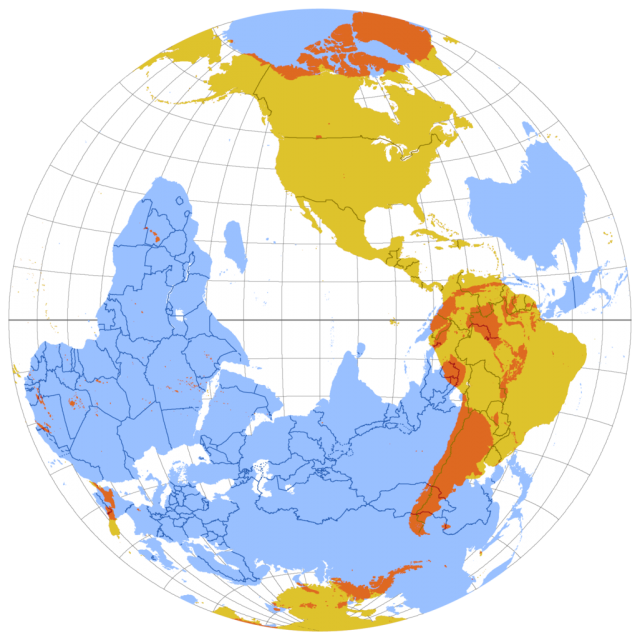 ), the term antipode was used in reference to a natural balance thought to be sustained by the existence of a continent south of the equator, equal in size to the northern continent. Ptolemy (100–170 C.E.) described this southern landmass as Terra Australis Incognita (unknown southern lands). In contemporary use, the term describes a point on the opposite side of Earth from another location. Antipodes are most often expressed as latitude/longitude coordinates. It is possible to compute the antipode for a given location by subtracting 180 from the location’s longitude and changing latitude from degrees north to degrees south or vice versa. For example, the geographic center of TAIWAN is located at 121 degrees east longitude and 24 degrees north latitude. By subtracting 180 from 121 for a longitude of 59 degrees south and changing 24 degrees north to 24 degrees south, the antipode of Taiwan can be identified as being within the country of PARAGUAY in South America. Measured in great circle distance, antipodes are the farthest place on the world’s surface from each other. A true circumnavigation of the world requires a traveler to pass through at least two points that are antipodean to each other. Some examples of true (antipodal) circumnavigations include Ferdinand MAGELLAN’s 1522 expedition in his ship Victoria and Sir Francis Drake’s 1580 journey in the Golden Hind.